We all know that Dr. Subramanian Swamy is fighting to restore dharma by rooting out the corruption at higher levels. He is the only one who engaged in preserving Hindu way of life for over more than three decades.He has taken up the cases many people dare not for fear of their lives and their future course of actions. Many of us call him as ONE MAN ARMY. He is working tirelessly to protect Hindu Dharma to make our lives better for tomorrow, secure better life for our children and preserve the freedom we are all enjoying. 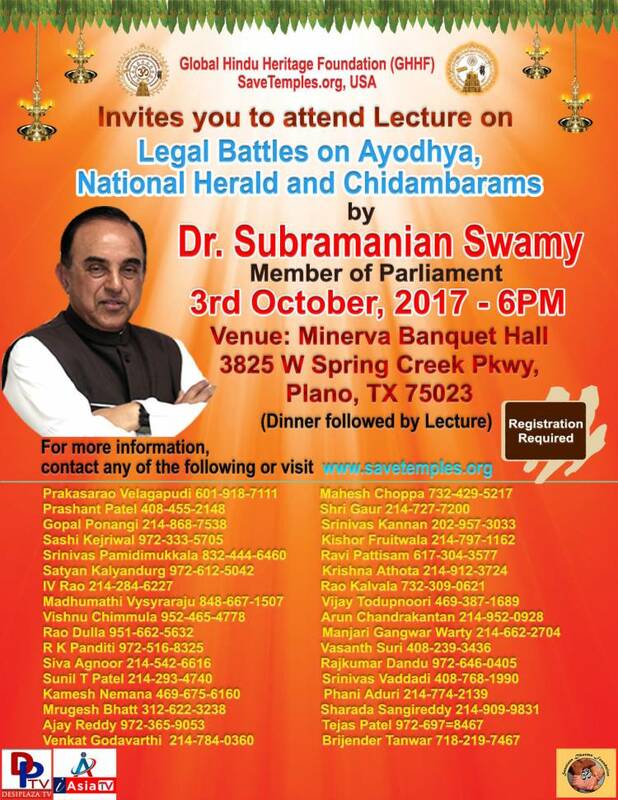 Last year, more than 600 Dallas area followers of Dr. Subramanian Swamy attended his lecture. Every one thoroughly enjoyed his speech. You all have made it into a very successful program. As you know, GHHF has been arranging Dr. Swamy's lectures for the last 7-8 years. As you also know, in order to arrange any program, we have to pay for the Venue, dinner, sound system, international and domestic travel and other incidental expenses. Further more, it is our moral obligation to help him to fight for these cases. We all know that is expensive to manage so many cases without help from his followers. In fact many of you suggested this option of paid registration to help the cause. Hence we request you not only to REGISTER, but also donate generously to fight the cases. Link to Register - Please click.